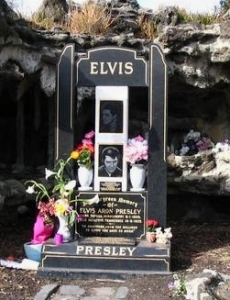 Who Took the Elvis Coffin Photo? 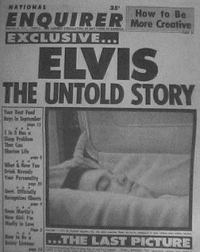 The Elvis in his Coffin Picture that appeared on the frontpage of the Nation Enquirer on 6 September 1977: Iain Calder, veteran Editorial Director of National Inquirer wrote a book, The Untold Story: My 20 Years Running the National Enquirer. Calder admits they acquired the photo from Elvis’ cousin Bobby Mann for $18,000. 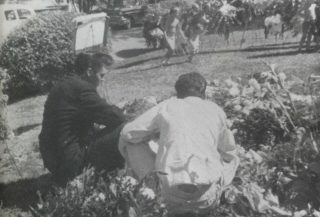 T he original photo of the famous National Enquirer picture of Elvis Presley lying in his open casket was shredded during a six-year anthrax decontamination effort on the tabloid’s former headquarters, according to the newest twist in a federal lawsuit. The front-page photo, which sold a whopping 6.5 million copies in 1977, is the center of a dispute between Boca Raton developer David Rustine, who bought the contaminated building at a bargain-basement price in 2003 while it was still sealed and quarantined and John Y. Mason, whose company, Sabre, was hired to decontaminate it. In a lawsuit filed, Rustine, values the photo at $1million, said Mason held the photo hostage in a dispute between the two over the cleaning. Rustine wants him to return the image or pay for it.